I’ve applied the official Premier League scoring system (which can be found here under Rules > Scoring) to each of the three EFL divisions to see what the best possible squad would be. Just like the official game, I’ve picked the best-scoring combination of two goalkeepers, five defenders, five midfielders and three forwards (hopefully without putting anyone into the wrong category), although if this were a real game then you probably wouldn’t be able to afford to put all of them in the same team. The only element of the scoring which I haven’t been able to apply is the bonus points, as these include stuff like tackles and passes for which there isn’t data available (at least to me). 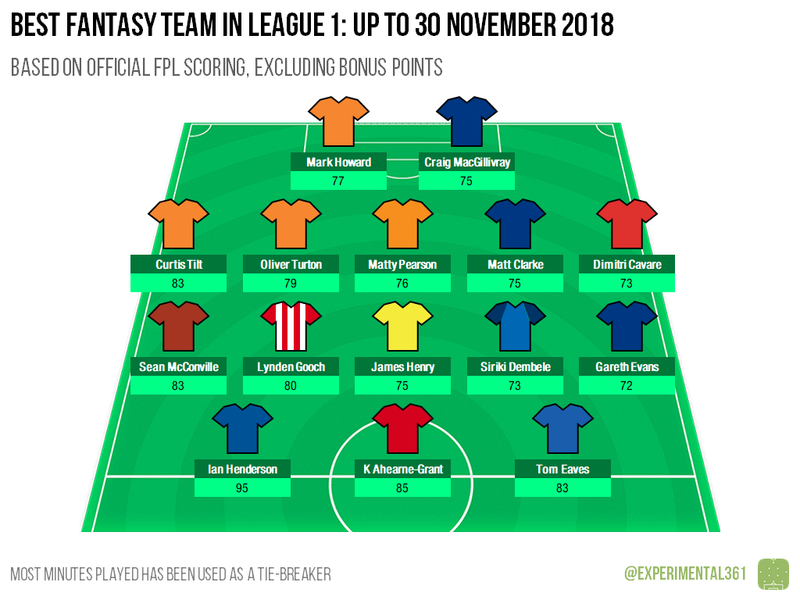 Also I think the FPL rules are a bit more generous around assists, but overall I think it gives a reasonably accurate impression of what would happen if they rolled it out across the EFL (fingers crossed). For each division I’ve laid out the top players on a pitch, in a style reminiscent of the official Premier League version, for both the most recent month and the season so far. 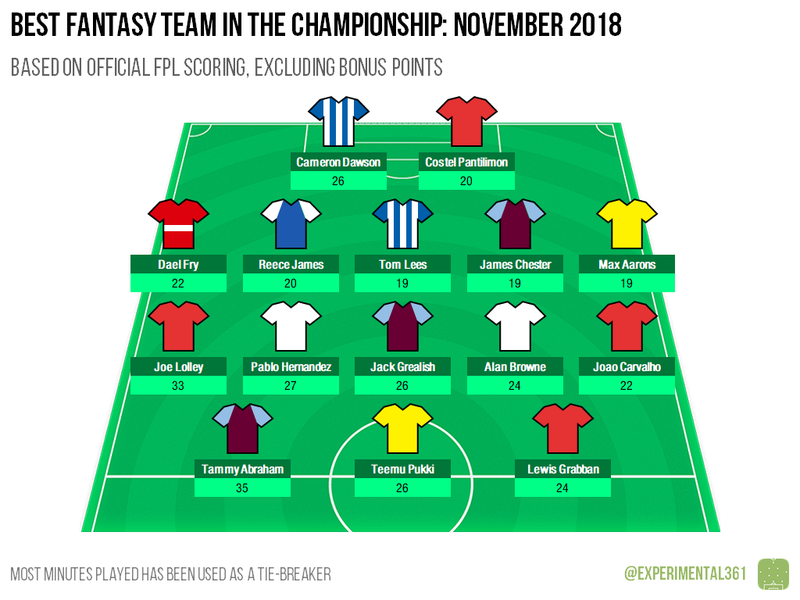 Tammy Abraham’s four goals in Villa’s ridiculous 5-5 draw with Forest sees him edge out Joe Lolley – who scored for the opposition in that game – as the top player overall. Both players also have team-mates who made the cut for the division’s best squad: two for Abraham and three for Lolley, making Forest the standout club with four representatives. Sheffield Wednesday’s resurgence looks to have owed the most to their rearguard, with Cameron Dawson the division’s top-scoring goalkeeper and Tom Lees joint third among defenders. Norwich were the only other side with more than one player. 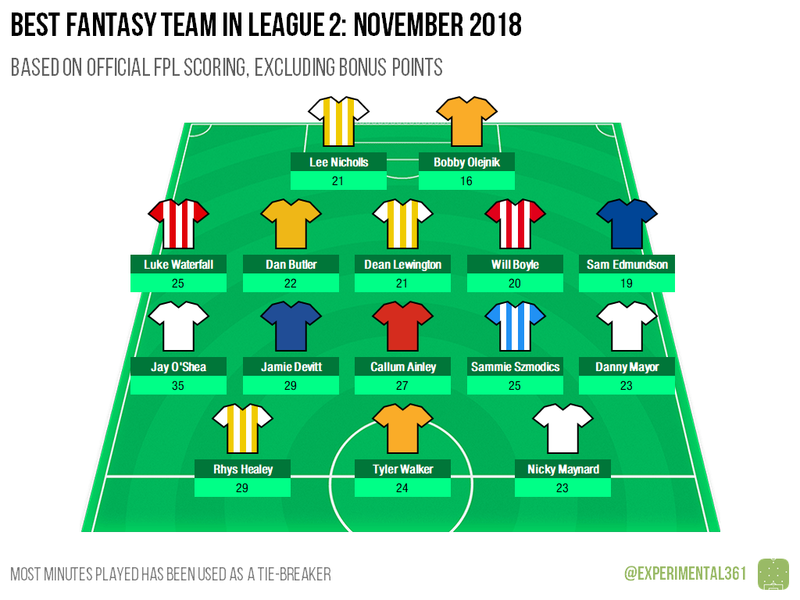 Lolley’s excellent month sees him edge ahead as the best-scoring midfielder of the season so far, while even a poor run for Brentford can’t dislodge Neal Maupay as the top player in the EFL overall. Middlesbrough’s defence continues to stand out, with the top keeper and two highest-scoring defenders in their ranks. 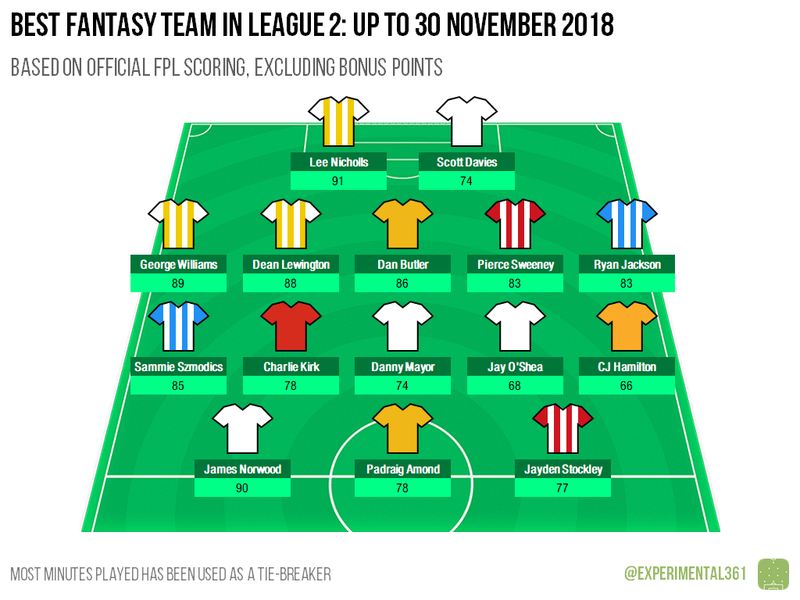 It’s been quite a month for Charlton, who have a player in each position in League 1’s top squad for November. The next most successful team was Luton with three representatives – again all in different positions. However the best performer overall was Sunderland’s Aiden McGeady who was involved in six goals this month. With three players apiece in the squad of the season so far, it’s safe to say that Blackpool and Portsmouth are performing well. All but one of these players are defensive, including both of the top-scoring goalkeepers, although none of them are scoring as highly as Ian Henderson of Rochdale, whose 12 goals and 3 assists – plus having started all 20 of their games – leaves him just five points short of a century. 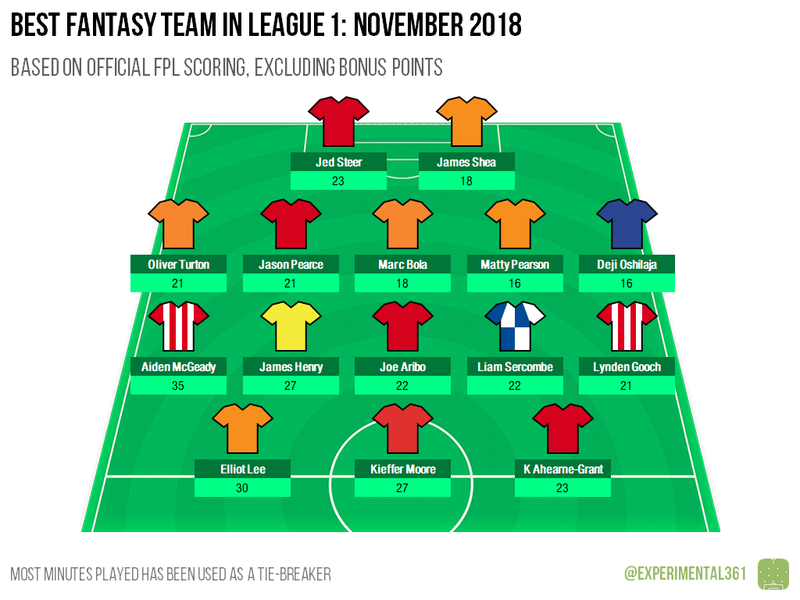 With three players apiece in the division’s top-scoring squad, MK Dons and Bury look to have had the best month overall. The Shakers’ Jay O’Shea was the standout performer overall – just like Aiden McGeady in the division above he scored four goals and set up a further two. The only other team with more than one representative in November is Mansfield. Just like Middlesbrough in the Championship, MK Dons have the season’s best-scoring goalkeeper – and the top player overall – in Lee plus the two leading defenders thanks to their 10 clean sheets so far. There are five other clubs with two representatives each, including Tranmere who have the best-scoring outfield player in James Norwood.